Lets take a look at some neat things you can do with the waveform modifiers in Expanse. Waveform modification is one of the most powerful features with plenty to explore. There are many fun things you will find with experimentation. Here are some gems that eXode found. Without further ado, lets jump right in. Classic wavetable synths did not have the resolution that we take for granted in modern synths. The oscillator wavetables had lower bit depth and reduced sample rate. 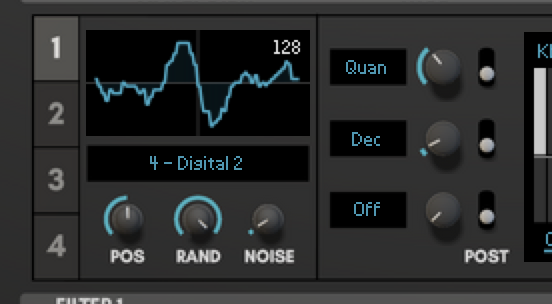 The Quan (Quantize) and Dec (Decimation) mods are perfect for emulating this. In fact, the decimation mod directly emulates the classic PPG Wave’s variable sample rate. This effect is a softball to get you started. All you have to do is use a little bit of the quantize and decimation mods. Adjust to taste. You could even add a tiny bit of noise for a hardware touch. 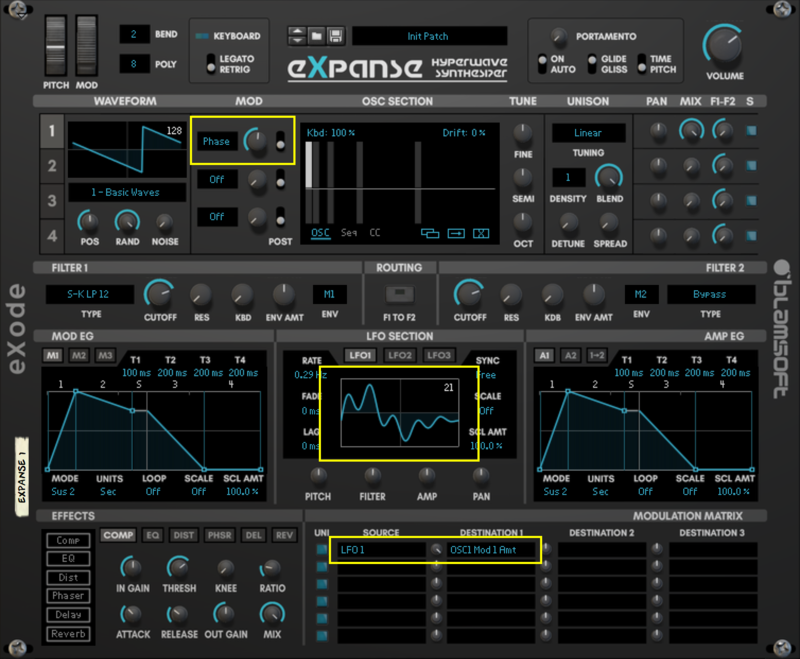 In Expanse, there are both distortion waveform mods and a distortion effect in the effects section. Both are useful in different situations. But lets say you wanted to allow some of your oscillators to remain distortion-free, Distortion adds higher harmonics to the sound and you may feel like you are losing bass when adding distortion. That’s where the mods come in. Besides the bit crushing mods mentioned above, there are mods for typical distortion. These include Sat (Saturation), Pinch (Inverse Saturation), Clip (Hard Clip), and Fold (Fold Back). Don’t forget about these when creating a bass patch. The FM (Frequency Modulation) mod works well to apply FM to a waveform. The ratio of the FM is 1-1 with a sine wave as the modulator. That means the carrier and modulator are at the same frequency. You can get other FM ratios by changing the carrier frequency. Ratios of N-1, with N being a whole number, are possible with the help of Expanse’s additive engine. The key is to use the FM mod in the Post Harmonics mode. That means the additive engine will modify the waveform before the FM mod. By selecting a single harmonic bar at a different harmonic frequency, you can get the FM ratio of your choosing. In the example, a ratio of 3-1 is being used. You may be interested in getting a really cool single cycle waveform for your oscillator while not as concerned with modulating the waveform. The Zoom and Phase mods come in very handy for editing the waveform. 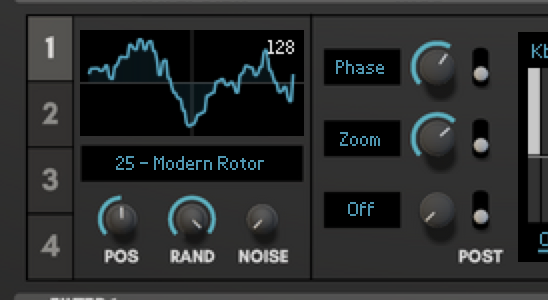 Apply the Phase mod first, it allows you to pan the waveform left and right. Then use Zoom, this allows you to reduce the harmonic content and end up with a more basic waveform shape. 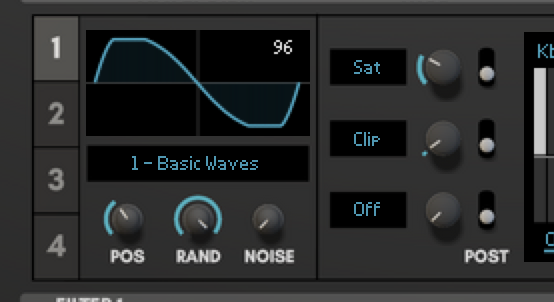 This works great on the wavetables that have complex waveforms. Phase and pitch are related, a constantly changing phase results in a pitch shift. You can use the Phase mod to create unique pitch wobbles. This can sound like a tape wobble with the right settings. Here, a slow LFO with a smooth wobble pattern has been routed to Osc 1 Mod Amt using the Mod Matrix. With this trick you can add beefiness to a sound by spoofing a square wave sub-oscillator added to the original waveform. Use the additive engine to tranpose the waveoform up two, three, or four octaves. Then use the Gate mod as a Post Harmonics modifier to zero half of the waveform. You can transpose the whole oscillator down to get the octave of the original waveform. An appropriate name for this trick might be “squarify”. It sounds a lot like the original waveform mixed with a square wave sub-oscillator. Now you have a taste of what mods can do. Happy modding! Absolutely love the mods! The whole device brings much needed modern wavetable synthesis to reason, the updated wavetables are stellar for any Edm production and I hope to see frequent updated wavetables added, that’s the one thing I wish propellerhead themselves would do thanks blamsoft!